Talk about teamwork! This twin clothing set spells out “Love,” and it takes two to get the message across. Make your twins even more double-take worthy by pairing them in this lovable set from Baby’s Language. Available in 100% organic cotton, these tees are sure to cause admirers to drool alongside their wearers! Talk about teamwork! 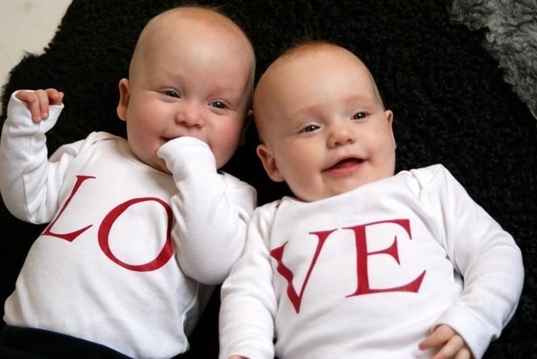 This twin clothing set spells out "Love," and it takes two to get the message across. Make your twins even more double-take worthy by pairing them in this lovable set from Baby�s Language. Available in 100% organic cotton, these tees are sure to cause admirers to drool alongside their wearers!